The DoubleTree Hotel will be the 2012 AIS National Convention Headquarters. An iris garden featuring irises from Region 15 hybridizers has been planted at the hotel and will be used for one-on-one Judges Training. Please note that hotel accomodations are not included in the registration fee. Many amenities come with the DoubleTree Hotel. The Ontario International Airport is just down the street. All major airlines fly into Ontario and the Hotel has a FREE SHUTTLE to and from this airport. You do not need to hassle with the Los Angeles Airport (LAX) and pay for a shuttle bus to the Hotel. The Hotel lobby also has a monitor with the current flights and gates leaving Ontario Airport and you can print your boarding pass FREE. There is a FREE SHUTTLE to Ontario Mills Mall, a huge multi-store indoor shopping mall near the Hotel. It has a large Food Court, all of the usual large anchor stores, and a movie theatre. Each room in the Hotel has a microwave, small refrigerator, coffee maker and TV at no extra charge. You do not need to rent anything extra. The Hotel has FREE parking should you decide to drive to the Convention or rent a car from the airport. The Hotel also has a car rental desk if you decide you want to do any spontaneous excursions on your own. There is FREE Internet in the spacious lobby and lounge area as well as the nearby Business Office. The Hotel is Pet-Friendly. A $50 non-refundable deposit will allow your pet in your room if it is under 25 lbs. Please be patient, the hotel registration site can be very slow. Char Holte is providing a roommate matching service. There is a vendor for electronic scooters who will deliver to the Hotel. Please contact him directly to order and tell him you are at the DoubleTree Hilton Hotel in Ontario, CA with the American Iris Society Convention. 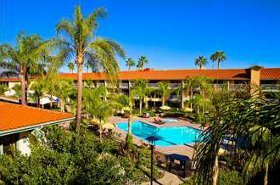 The DoubleTree Hilton does not have a car rental desk at the Hotel, but there is a FREE SHUTTLE to the Ontario, Airport just down the street where you can rent a car during your stay. The DoubleTree Hilton offers a regular Hot Breakfast Buffet every morning for $14.95 plus tax and tip. When you check in to the Hotel, tell the Registration Clerk that you are with the AIS 2012 Convention and you will be able to get the same breakfast for $10 plus tax and tip.